Here is first post in series of ‘Complete guide to Google+ Events ‘ which will help you understand all about Google+ Events . If you are a Google+ user, you would want to utilize the features of Google+ events to the full extent. This post will cover basics about the Google+ event as well as the inbuilt and integrated features of Google+ event. Some of the issues have with Google+ events have also been highlighted at the end of the post. As per Google, Google+ events is the a new way to create, capture and share private and public events. You can create Google+ events set a theme for it, post a video message, upload photos during and after the event, have friends attend event from different location (Hangout). With all these features, you would find Google+ event a very interesting thing to try for next event you are planning. There are several different themes which an user can choose based on the event type, be it a birthday party or any other occasion, you would find a theme matching your event. If you didn’t like Google+ Featured themes and want to create on your own, just upload any pic from your phone, desktop or Google+ album and set it as a theme. Featured themes does have little bit of animation which gives a nice look to your event page. 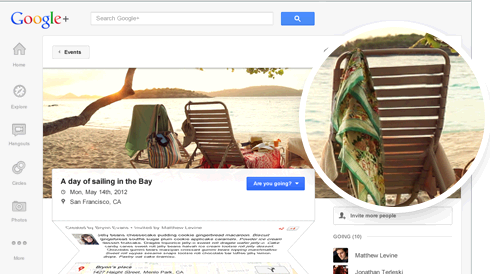 You can even add a YouTube video as a greeting message on your Google+ Event. Unique animations can be added too. Party Mode allows you to click Photos using your phone and then share with everyone in real time. 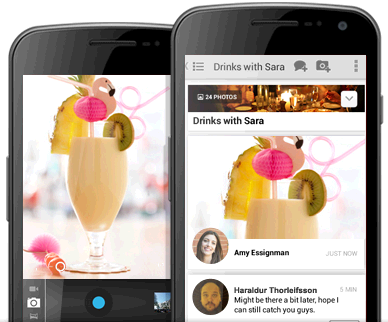 Android phone users can use the party mode to share the photos and videos instantly. Whenever a party starts, you will get a popup on your phone asking you to switch ON the party mode. Once Party Mode is enabled, just start Clicking pics and all the new images will be uploaded to the Event. Besides uploading the photos on Google+ event, Google+ will create live slideshow which can be projected or seen by guests during the party.Party mode can be switched off whenever you want. Google+ Events allows for a Shared Photo Collection where not only you but the guests invited to the party can also upload pictures. Similarly if you have been invited to a Google+ event, you can upload your party pics directly on the Google+ event photo stream. You and your friends can even add photographs later or you can also pull them from any other Google+ album and add it to your Google+ event. Google+’s Shared Photo Collection is really great as now it will be the best place that would contain most of the pictures clicked on the event. You and your friends can comment and discuss right within your Google+ event. Who clicked that photo ? (Photographer), Who is that guy? (Tagging), Who is the girl everyone is talking about ?(Popular). All such answers will be right there in your Google+ Event. Google+ events are integrated with your Google Calendar so you can check your schedule before you send or accept any Google+ event invite. Once Google+ event is created or accepted, it will be automatically added to your Google Calendar. If you are unable to attend any Google+ event, you can always take advantage of Google+ Hangout and interact with your friends attending the event. 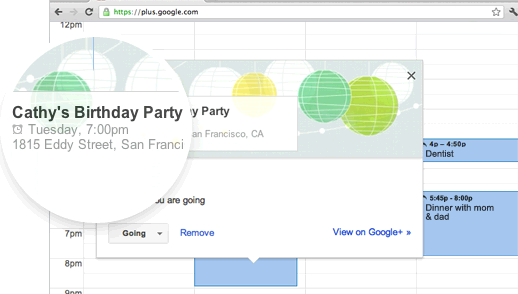 Google+ Hangout option can be selected while creating a Google+ event. As soon as an event starts, everyone will be notified about the Hangout and you can go to event page to join the Google+ Hangout. 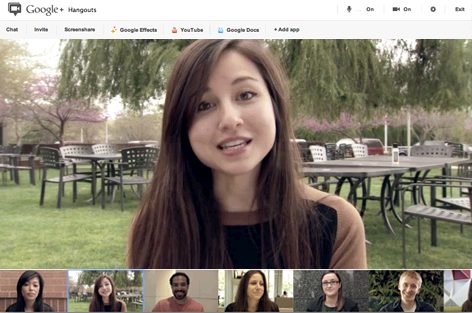 Google+ Hangout is currently supported up to 10 users. You can even have a virtual meeting using the Google+ Hangout feature. Send event invite to all the parties (upto 10 users) and then enable Google+ Hangout (Online Event only) option. Make you event public and anyone can find the event page of a public event,view and upload photos, share the event with friends and make comments. If you have added an address to your Google+ Event, your guest will be able to see the maps on the events page and get the directions. When Google+ event was introduced many Google+ users complained to Google that they are flooded with event invites and are totally annoyed with the Google+ event invite notifications. Earlier Google+ didn’t had any option to disable event notifications. Later Google+ team introduced the feature to disable event notifications which can be done in privacy settings. Don’t send event invite to public if you don’t want yourself to be blocked or muted by them. While guests don’t have to be Google+ users to receive an invitation to an event, they will need to have a Google+ account to stream and be tagged in photos while the event is in “Party Mode”. Another potential issue involves party-goers forgetting to switch off the “Party Mode” feature, meaning photos they take will still stream to the site until the end time the event’s creator has designated the party to end. So, if you forget to turn off Party Mode, the creator doesn’t end the event until the next day, and someone has used your phone to snap photos of you after you passed out, remember everything is posted instantly on Google+ Event page. This is the first post in the series of ‘Complete Guide to Google+ Events’. If you have any suggestions or tips related to this post, feel free to mention in the comment section below.